Today I have a couple of cards to share with you. I used the gorgeous DCWV Floral Fair Paper Stack along with My Cricut Artiste Cartridge and some stamps and ink! 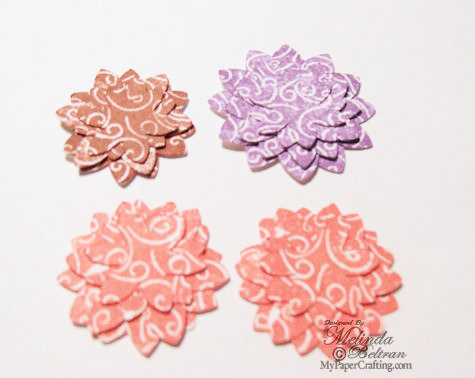 This month is National Stamp Month, so I will be showcasing projects using some Great Closet To My Heart Stamps as well as some great digi stamps from PaperCraftingWorld.com. 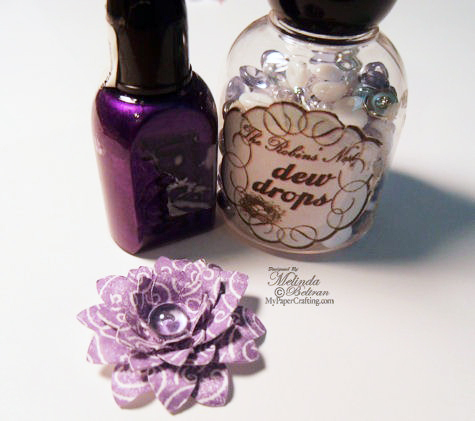 I also have a great little tip on how to "color your dew drops". So let’s get right to it. Here are my two cards. I am created them for this month’s IFTL (I Feel The Love) September Recipients. Please be sure to head over and get the details and join in. You will be blessed that you did! I cut my flowers out of the Artiste Cartridge from plain white cardstock. 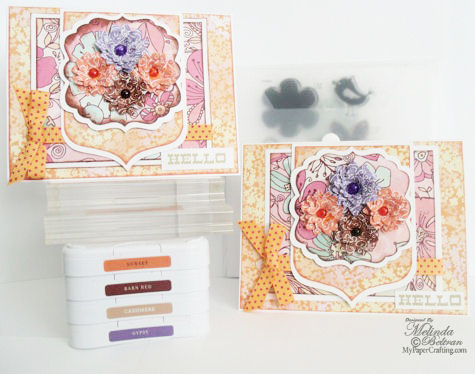 I used CTMH Hello Blooms Stamp Set to stamp the flowers. This stamp set has several stamps that have corresponding cuts to the cartridge. Instead of using the recommended size, I simply cut my flowers smaller and then lined the stamp up. It still covered the flowers perfectly. 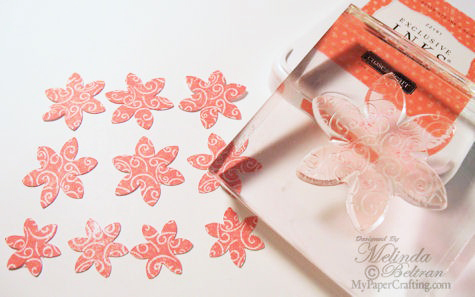 I did this to create flowers with the Sunset, Gypsy and Barn Red Ink Pads. I glued and staggered the layers. Once the layers were dry, I took a thin bamboo skewer and shaped the petals to give them some dimension. The flowers were cut at 1.25, 1 and .75 inches for the different layers. Next I wanted to add some dew drops to the centers. I have the pretty Morning Dew set. I love the clear softly colored look of the gems, but wanted a stronger more striking color, so I decided to try and “paint” the dew drop with my Smooch Pearlized Sugarberry Ink. Here is a picture to show you what it looked like after I brushed some of that ink on. I thought it worked perfect! It still gave the gem a semi-translucent look but deepened the color beautifully! Here is just a view showing what they look like…before and after… or in the case of this picture....after and before...lol. So I decided to get crazy and used the Siren Smooch Ink to color the soft orange dew drops from the Island Blossom set. Lastly, I used the little Hello sentiment from this stamp set and stamped it with the Cashmere Ink. 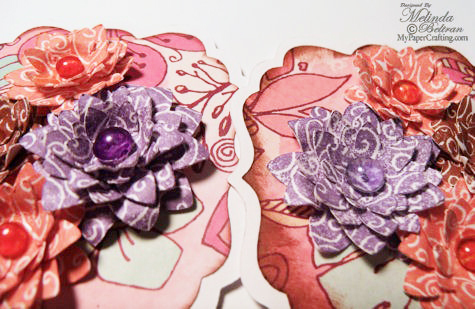 I layered the card with layers of that pretty DCWV Floral Fair paper and added some ribbon from my American Crafts Dots stash of mini ribbon spools. Here again is one last look at both of the cards. I used the following products to complete these little gems. Aside from creating these cards to send in to IFTL, I am entering them in a couple of challenges. First, The Heart 2 Heart challenge blog is having a color challenge and the other is a sketch challenge over at the seems a little sketchy challenge blog. Well, I think that about covers it for today. I hope my little tip about coloring your dew drops will inspire you! 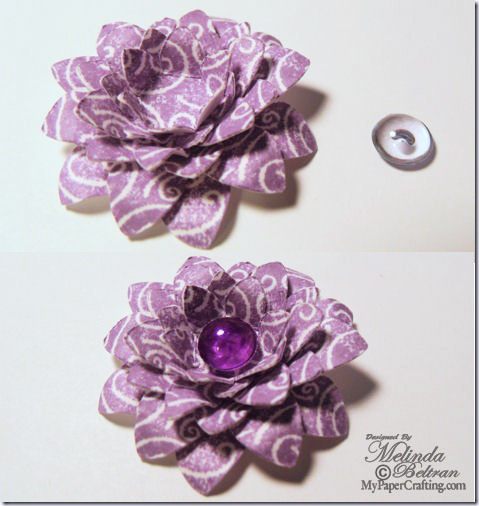 As always, thank you so much for stopping by and sharing your crafty-creative time with me! Be sure to stop back by tomorrow for another great, inspirational project! Fabulous card. The flowers are so beautiful. Beautiful card! I love your take on our sketch! Thank you for joining us at Seems A Little Sketchy! Love the flowers and the dew drops! Thanks for playing along this week at H2H! Oh my I love this card! Those flowers look amazing with the dew drops!! I am in love with the fabulous papers you used too!! Love the card design as well! Hugs! LOVE those flowers!!! Thanks so much for sharing them with us over at H2H!